(Refer: DECLARATION OF FACTS: UCC Doc # 2012127914 Nov 28 2012)“...That any and all CHARTERS, inclusive of The United States Federal Government, UNITED STATES, “STATEof ...", Inclusive of any and all abbreviations, idem sonans, or other legal, financial or managerial forms, any andall international equivalents, inclusive of any and all OFFICES, inclusive of any and all OFFICERS, PUBLICSERVANTS, EXECUTIVE ORDERS, TREATIES, CONSTITUTIONS, MEMBERSHIP, ACTS, and any and allother contracts and agreements made thereunder and thereby, are now, void, worthless, or otherwise cancelled,unrebutted; . What does this mean to Banks & “Governments”? What is the UCC - Where and to whom does it apply? The Uniform Commercial Code (UCC) is the ‘bible’ of commerce and used world wide, but sometimes in disguise.UCC is not taught in law schools; it is used in high level banking and government corporations. Accordingly mostlawyers, attorneys and magistrates know nothing about UCC and will argue it has no application.1. Executive Order 13037 dated 04 Mar 1997 defined humans as capital. See:http://americankabuki.blogspot.com.au/2013/03/us-citizens-defined-as-property-of.html2. UCC Doc # 0000000181425776 filed 12 Aug 2011 evidences sale of US citizens in transaction between The Federal Reserve System and The United States Department of the Treasury 1789 for $14.3 trillion. (Linked above)3. UCC Doc #2001059388 evidences the template the Federal Reserve Bank of New York uses to secure thecollateral in major banks around the world... including chattel paper, goods and the unborn young of animals. Seehttp://www.mediafire.com/view/?3yh79cjnzcwzu0sThose who would regard the UCC as irrelevant outside the US are thereby claiming former funding arrangements withthe Federal Reserve Bank of New York null and void. Given the usage of UCC filings in the upper levels of “government” and banks worldwide, due diligence is a necessity.If there is a dispute, error, or falsity make AND deliver a duly verified sworn DECLARATION OF REBUTTAL to theduly verified, sworn and REGISTERED OPPT DECLARATION OF FACTS, point by point, with specificity andparticularity, with full responsibility and liability, under the penalty of perjury under any law you identify, that theforgoing is true and accurate, signed by your wet-ink signature.To date, no such rebuttal has been registered. (Refer Notice of Declaration of Absolute Truth UCC# 2013032035)The final filing of the OPPT occurred on March 18, 2013. This document terminated all remaining man-made entitiesand returned all people of this planet to absolute freedom. In this document the creator is referred to as "absoluteessence" and all creations people are referred to as "absolute essence embodied".Article VI states..."I duly verify, with full responsibility and liability, by DECLARATION OF ORDER, that eternalessence IS made transparent and known by the DO'ing of any and all embodiment of eternal essence in eternalessence's universe, IS free and free of debt, unrebutted. "This means THERE IS NO DEBT.You have no debt... No one has debt... it is done. Training Manual for Jurists is on "Training" tab with other material. All people must participate in learning about how we were misled and how we are going to allow those who have wronged us, to fix things for us, failing which they will be removed from public office for embezzling public money and committing Treason against the people they are meant to serve. 05 March 2014: RESPONSE TO INDICTMENT (5.4mb) (1.8mb) without referring to the evidence of Treason, Perjury, Fraud, public interests, falsely alleging "vexatious" to deny effective remedy of Grand Juries to stamp out injustices by single judges. • Body ex-patriated to India in 2007 and Delhi High Court WPC 6179/2007 filed. Coroner Bill 2008 drafted by 18th Law Commission Report 206 to enable interstate and private post-mortems in India. Principles of the laws of nature and of nature's God. • to be treated equally before the law. • with certain unalienable rights. • with the right to govern themselves according to their written consent. • To retain the right to alter or abolish an unlawful form of government as an exercise of self-government. • to organize the civil government's powers in such a way as to secure their happiness. The Vedas & Upanishads are the philosophies which have moulded most thoughts & beliefs in the East for twenty six thousand years. The fifth 5,200 year cylce completed the 26,000 cycle on 21 December 2012 when the Dark Age of 1,300 years flipped into the Golden Age for the next 1,300 years, hence the "Pentagon"
Principles of self progression by unlimited choices & creativity based on Oneness, Freewill, Non-interference, community, collective wisdoms of love, compassion, forgiveness, gratitude (hoo'oponopono). • History of NESARA: Nancy Detweiler, M.Ed., M.Div. • Initiates new U.S. Treasury Bank System in alignment with Constitutional Law; Eliminates the Federal Reserve System and restores financial privacy; Retrains all judges and attorneys in Constitutional Law; Establishes Peace, and ceases all aggressive, US government military actions worldwide; Releases enormous sums of money for humanitarian purposes; Enables the release of over 6000 patents of suppressed technologies such as free energy devices, antigravity and sonic healing machines. MATTHEW’S MESSAGE – MARCH 11, 2013 "Why are things moving so slowly"
15. Routine persecution of Litigants in Persons, especially those on State benefits (who are fees exempt), children, homeless, disabled, elderly, Whistleblowers. • Government Inquiry reviewed 5,000 children put into care by Professor Roy Meadows due to his questionable evidence relying on statistics in baby deaths. 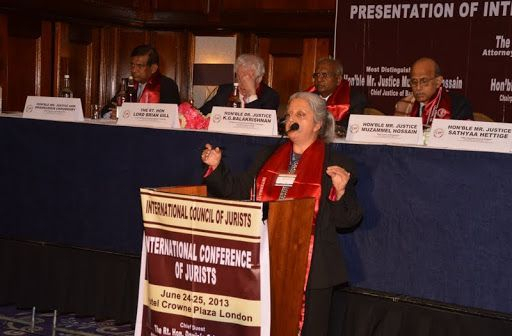 I was delighted to meet some of you at the International Conference of Jurists on 24 June 2013, in London organized by Dr Adish Aggarwala. Thank you for requesting a copy of the book in 1. Below. I also include another book by the same author in 2. below regarding my baby neice of whom I spoke, baby Sunaina Chaudhari. In 3. below is the link to the 6 minute video about the advanced technologies I referred to. "On the publication of the first edition of his book, the Most Corrupt British Judges, the Author, a lawyer with over fifty years experience of legal practice, sent copies of it to the Lord Chancellor, and the Commissioner of the Metropolitan Police in London with formal complaints for investigations of the crimes committed by some judges. The office of the Lord Chancellor promised to carry out necessary investigations. When the Author demanded that the investigations comply with the rule of natural justice, or that they treat the complaint as withdrawn, they opted to treat the complaint as withdrawn! On receipt of the complaints, the Commissioner of Metropolitan Police appointed Senior Superintendent Coles, to investigate it. As no investigation took place, the Author made a formal application to the criminal court for a private prosecution of one of the judges, Lord Justice Morrison for the offence of perverting the course of justice. The application was not dealt with by a Magistrate as required by law but by a court clerk who rejected it on the ground that it would create a precedent, where judges would no longer judge without fear. In short, that judges were to be above the law! The author appealed to the High Court which upheld the decision of the clerk and refused to have the case heard on its merit! 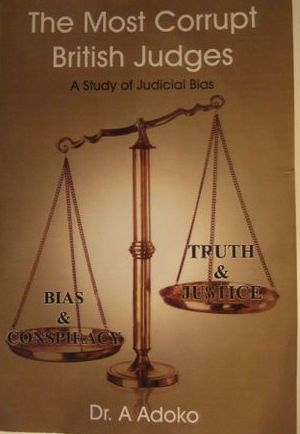 Though the book was published on the Internet and an affidavit affirming that the accusations in it are true, yet no notice to sue for libel was ever given. Nor was there a criminal prosecution for perjury although at the time, former Minister Jonathan Atkins, and former Chairman of the Conservative Party Lord Jeffrey Archer were prosecuted for perjury in similar circumstances. Failure to prosecute and to sue are admission that the abuse of judicial power complained of took place. " 4. Vincent Bugliosi, Attorney has called for the prosecution of George W Bush for the murder of thousands of American soldiers in the Iraq war and upto a million Iraqis. He has also exposed the prior knowledge of 911.